One year ago before I came to CERN I had no idea what the Higgs boson was, I thought a wormhole is where birds are sent to when they die and Quark is a kind of food I like. I thought life was the biggest concoction of coincidental and wicked confusion, until one day someone tried to explain the string theory to me. I had no expectations, no worthy predictions of what this place had in store for me and I was living in an apartment with a kitten that chased her tail and thought she was a dog. I had never lived with an animal under the same roof before, at least not with one that snarls at me when I accidentally step into her imaginary turf. Unfamiliarity can be a pain, and in my case this pain comes in the form of a hypothetical particle and a purring creature. They’re both unpredictable, volatile and I can’t decipher them with my engineer-geared mind where “hypothetical” is a shunned word and used only when you have no idea what you are talking about, and a string is really just that – a string. I felt like someone just threw me into a whirlpool akin to the infinite improbability drive1 and asked me to engineer my way out of this whimsical maze. The Higgs and the cat suddenly seemed like two monsters disguised as science, waving their “hypothetical” paws at me and I couldn’t decide if they are really as harmless as they seem to be. And it drove me crazy. But just like how all adventure tales end, over time I realized that even the scariest monster can be tamed if you are determined enough (or in some cases, if you are a whiny teen with a scar on your forehead and your enemy dies by committing suicide). I didn’t have my crystal ball with me when I arrived, but even without it I knew that I could only survive if I opened myself up to find out as much as possible about my enemies. Armed with the age-old wisdom of “Keep your friends close, but your enemies closer”, I set out on a mission to acquire as much knowledge as I could about the unpredictable Higgs and kitten. They were the symbolic representations of everything that was mysterious, incomprehensible and unfamiliar to me, and I couldn’t wait to reveal their darkest secrets. Unfortunately for me, I am not a scientist, nor an animal trainer. And the most interesting experiment on the topic of mind reading I have ever done involved me and my 6-year-old brother, some poker cards and a mirror. So even if the Higgs and the kitten are, metaphorically speaking of course, unfamiliar territory, I knew that I would have no choice but to face it head on. And that is where the beauty of CERN lies. This is a place where finding out about the unknown is the heart of all research, and wandering into unfamiliar territory is the way to go. The buildings are scattered and numbered without any logical coherence but opportunities are abundant. People are different and unpredictable but they are also kind, inquisitive and creative. You walk into a big hall not knowing what to expect and are suddenly greeted by a grand piano. Some guy does yoga and stands on his head right in the middle of the field in full view of everyone having lunch. You have some of the brightest brains in the world gathered in one place, and yet nobody hesitates to applaud and cheer if you decide to run the annual marathon wearing just a hat. This is a place where every possible difference you can think of, comes together, fight, kiss, make up, compromise and advance together. I set out to conquer the Higgs and the kitten, but we ended up becoming friends. When one is immersed in an environment so receptive to foreign things and occurrence, you can’t help but to slowly shake off that protective colour and evolve. When in search of some worldly pursuit, we are often held back by our own perspectives and become slaves of our mind. But in the one-year course of living with the Higgs and the kitten, I learned that when something doesn’t fit into my pre-conceptions, I can widen my perspectives to accommodate them. Even for something as flighty as say, a kitten. 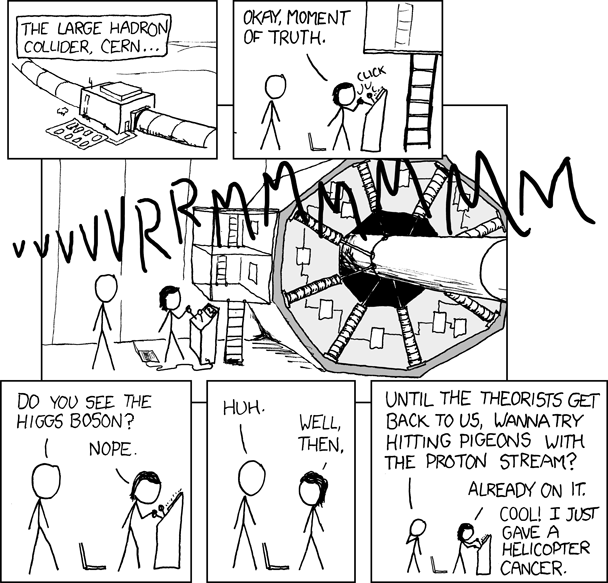 And that is the story of the Higgs and the kitten. The world changes every day. Every day you discover something new about the people around you or yourself. So one day if you find yourself stuck in a pickle with some strange objects with a name you have never heard of, or an unknown creature with sharp claws, remember one thing – the best way to tame a bull is by grabbing it by its horns. And of course, have your friends back you up while you do that. And then celebrate with a beer. Yi Ling Hwong is a Marie Curie Fellow at the European Organization for Nuclear Research (CERN), working in the field of Data Acquisition, Electronics and Optoelectronics for the Large Hadron Collider Experiments (ACEOLE). She holds a Master of Engineering from the University of Applied Sciences Karlsruhe in Germany.
 . The Infinite Improbability Drive is a faster-than-light drive. It is based on a particular perception of quantum theory: a subatomic particle is most likely to be in a particular place, such as near the nucleus of an atom, but there is also a small probability of it being found very far from its point of origin (for example close to a distant star). Thus, a body could travel from place to place without passing through the intervening space (or hyperspace, for that matter), if you had sufficient control of probability.